In this thread, I can post photographs of my guyver novel. then these pictures can be used to get a translation of the novel. I will forget so if people post in here at least once per week, I'll aim to post one double page spread once per week. if nobody posts, I will not remember so if you want to read this book, keep this topic alive so I'll remember. That's a really great looking cover; it almost looks like a watercolor picture, it's got that kind of a softness to it. I wonder if it is. I'm thinking a sunday would be a good day to post these. Feel free to use google translate and any other online translator to get funny results. Just out of curiousity, where exactly does this story fit into the Guyver mythos? I think it's an AU, or at least it's AU-ish. O.o okaaay....I put that through a translator. "Ms. Tetsuro"? Can I ask how the hell that happened? I'm guessing this fits in during the time Sho found the Guyver and before Max Pharmacuticals got blown up. I think it's almost like a behind the scenes look at the first two or three chapters of guyver. I'm not sure about how faithful it is to the manga but i think it's meant to be pretty faithful. as it follows another character as the protagonist it gives a different perspective on those events and surrounding occurrences. i remember this book being talked about a few years ago...is there a few others or am i making that up?? that is clear as mud! this novel is pretty challenging for anybody. we need your expertise for this. He, up until now, only lost consciousness once. Playing tag in the kindergarden, the foot slipped in the concrete genko, of course by chance the head was hit. In an instant, the scenery began to spin, I thought that I have seen the vividness of the blue sky, then becoming total darkness, not knowing anything at all. When I regained consciousness, I was lying in a tatami-matted room, mother was peeping with a worried face. I was thinking that this is the kindergarden so how come mother was here, I still remember that now. What was more mysterious, was I remember the total darkness when I lost consciousness. Since I lost my senses, even though I shouldn't be able to perceive anything, I know of that time. ....right now, the same thing was happening. When I see surrounding scenery, I know that he was inside the darkness. Then I myself, there is no mistake that I lost consciousness. My sense has returned. However, my state, there is something strange. What I see is much more distinct than usual. Nevertheless, I can feel the distance from the physical world. Then, there was a strange silence. For example, is that really so. He was looking at the scene with absent mindedness. A meadow enclosed in the forrest. In front of their eyes was a swamp. ...in the corner of the eye, something moved. The boys in school uniform has their hips just above the grass. A frightened expression. With both hands, they stepped back. In that form, I remember. He was bewildered by his own voice. Though clear has a reverberating sound. Just like always, the usual high pitch. The boy was surprised, looking over here. shall i post the next double page now, or shall i wait until Sunday like i had originally planned? btw, this is really interesting, a wonderful look inside of shou's head as he first became guyver. It's actually up to you. Since you have the book, we will follow your pace. The first pages were posted on a Wednesday and 4 weeks has passed since then. We don't seem to be following any schedule. If you have the chance to post it, why not? Like you said, we'll just poke you when you don't post the subsequent pages. Also, since no scanlation is necessary in this side project, do you think it would be wise to post this straight into the wikipedia? I'll volunteer to setup the page (like always). I plan to have 2 pages for this, one in the original japanese text, while the other a translated text. I mean, we will still continue this, but we'll update the wiki to reflect the information posted here. Oh I remember this, we talked about this years ago, recall a few fans showcasing it about. I'm beginning to see where the Anime borrowed some of it's story telling form. do you mean the project toku wiki? because i don't want to post this to wikipedia! well this is usually the kind of thing I do, but if you want to do it, I have no qualms about it. If we were to take this into account, this clearly shows that Shou was unconscious when he first donned the Guyver. are we hosting this in japanese on our wiki? I mean, are we having both japanese and english? well you know, I guess this is a really slow project because nobody seems that bothered by it. 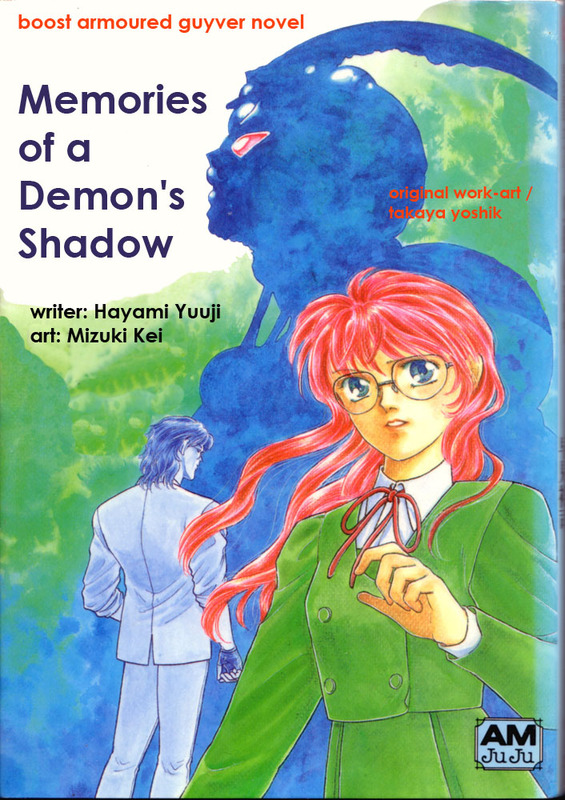 there seems to be no interest, which is surprising since this is a guyver novel that has never been seen in english. it contains story elements that nobody has ever experienced. I am honestly surprised that there is so little response in this thread. I mean, why am I the ONLY person to make any comment on the first translated page? it appears that I am the only person interested in this story. if that is the case then I'm not sure if there is much point us continuing this? on the other hand, is it possible people are not interested in this because japanese texts are being posted and they find it intimidating? I don't know.. I hate to say it, but is this a situation like in oliver twist? well, i can say im interested in it at least..
this is not an attack at Durendals translating as it's better than i could do (which is zero)-and its way better than google... but one thing that strikes me personally is that it is not very easy to understand. i think its something to do with the tenses or something, im not clear whos saying what, and if its first person or they're observing or being observed, it seems mixed up to me and im second guessing if im interpreting the english correct?? i know you like to leave the scripts of the Manga relatively untouched and just translated without paraphrasing, but reading continual text in this way is a little weird and instead of enjoying it i am trying to figure out what is meant. its not a demand!!! and it might seem unfair to ask because there is enough work involved anyway , but it would seem Durendal (or Ryuki??) is in a better position to do a more paraphrased translation because he/they might understand the original better, thus leaving less room for error ??? page 1 was not too hard and i dont think i strayed too far from the translation, but be prepared to scold me for page 2!!!! Up until now,i had only lost consciousness once. While i was playing tag in the kindergarden,by chance my foot slipped on the concrete genko and i hit my head. In an instant, the scenery began to spin, then i think i saw the vividness of the blue sky, then it faded to total darkness, and i was unconscious, not knowing anything at all. When I regained consciousness, I was lying in a tatami-matted room, mother was peeping in with a worried face. I was thinking that this was still the kindergarden so how come mother was here?, I still remember that now. What was more mysterious, was that I remembered the total darkness from when I lost consciousness. Even though I had lost my senses, and shouldn't have been able to perceive anything, I still know of that time. When I see the surrounding scenery, I know that i was inside the darkness. Then I came to, there is no mistake that I had lost consciousness. My senses had returned. However, there was something strange about the [ state of my being]. What I can see is much more distinct than usual. Nevertheless, I can feel the distance from the physical world. Then, there was a strange silence. i looked at the scene with absent mindedness. It was a meadow enclosed in the forrest. In front was a swamp. ...then in the corner of my eye, i saw something move. The boys in school uniform [stood in the meadows grass that was nearly as tall as] their hips. [ Both had ]a frightened expression. With both hands [open/up/? ], they stepped back. He was bewildered by his own voice. Though it was clear, it had a reverberating sound. Just like always, [with] the usual high pitch. AND let the scolding begin! I hope you don't get scolded because I like what you've done. I appreciate your honest comments too. I understand about wanting to leave it until there is more text to read. also, the phrasing thing is very understandable. when translating it is often very difficult to take the phrasing of one language and adopt the natural phrasing of another language. it's like coming off a motorway straight into a built up area. it's difficult to adapt to the different rules/conventions. I often find it difficult to phrase things naturally when I am translating. anyway, I just checked quickly, and this is written in the third person. so your instincts about page 2 were correct. although the beginning of page two, is clearly written in the first person. so I feel this may be a writing device. I got this impression that the perception of shou when he regains consciousness is very odd. kind of distant or disconnected. so this could be why he refers to himself in the third person. durendal, I am realising that a novel is pretty hard going, especially with the way prose is often written. is this intimidating for you? does it seem like a lot of hard work? I'm just trying to read the situation here. Good point Aether. Raw translations like what I have done usually needs editing. Lot's of it. Like you pointed out, it's difficult to determine who said what, because you only get to read a part of the whole story. The trick here is to understand it through context, and one page is somewhat limiting it. The original Japanese text did not have any "he" or she" so we really need to rely on context. After reading through the first part, it is only then we find out that it was actually Shou's thoughts we are reading. Ryuki, I think it would be best to include both english and japanese text on the wiki. I haven't gotten the time to do it yet since there was something important I had to attend to during the weekend. It is true that one page is not enough to satisfy the curiosity of the readers. Usually, one chapter of a book would be enough to gain a discussion. Don't worry and endure this only until we finish one chapter. Then we can have a lot of people to discuss that. You have to admit, a couple of pages isn't really interesting enough, especially that one particular part, if we convert it to the manga, that's probably just one or two panel. I would love to sit down one afternoon and read a huge chunk of the novel. I think I'll wait until you guys have it finished first. This is a novel, afterall; not a datafile. There is a difference in the way it is meant to be read. Don't worry. I've translated novels much more difficult than this. It's not really difficult. Like I always say, I needed someone to edit my translations to make a lot more sense. Besides, those two pages didn't help much with the context.